#MyCamas is a “Top 6” Finalist in the The Small Business Revolution “Main Street” Contest! Camas is in the running for a $500,000 investment, a starring role on a Hulu TV series, and life-changing makeovers to local businesses. Typically only 5 towns are chosen, but this year they threw in a twist and chose 6 towns. Camas is the only town on the west coast chosen in this competition and with a win, would be the first west coast town in this acclaimed series. We need to SHARE THIS with everyone you know! We need each reader/viewer to get 10 people to vote every day! Simple Steps to Vote for #MyCamas! *Vote once per day per email address through February 19th at 6pm. Camas is the only town on the west coast chosen in this competition and with a win, would be the first west coast town in this acclaimed series. Let's do this! Thank you so much! 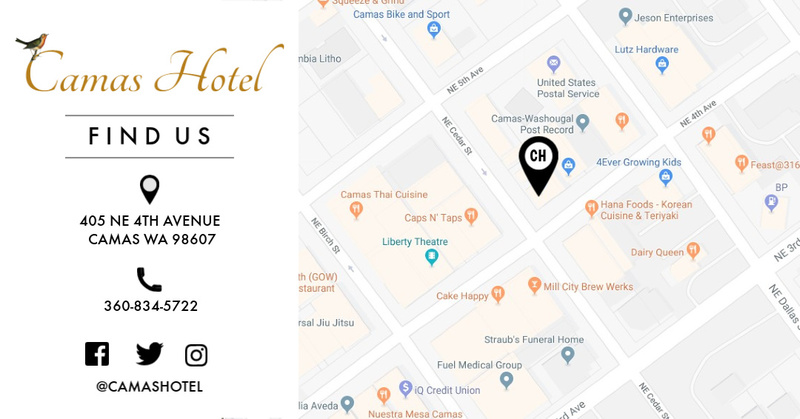 "The Camas Hotel, located in the oldest commercial building in downtown Camas that was built in 1911, has been charming visitors with its historic details ever since it was founded. The hotel has been owned and operated by many people throughout its time, and when Dave and Terri Sauer purchased the hotel in 2016, the space had been recently completed and renovated to define it as a luxury boutique hotel. The quaint hotel consists of 23 rooms, 15 of them with private bathrooms, and eight with shared European-style bathrooms. Because of the different types of rooms, there are various price points that attract people with a wide range of budgets. 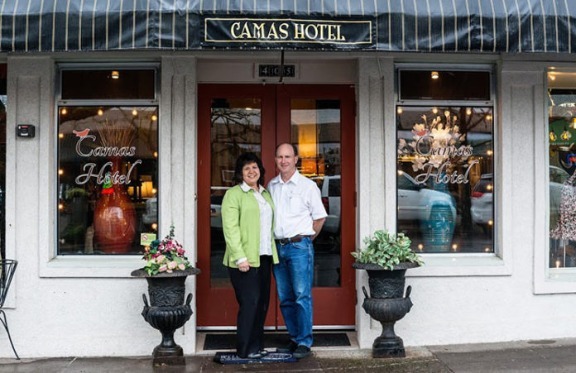 Currently, there are 10 employees on average that work at the hotel, and Terri said that the revenue growth has been pleasantly moderate, as downtown Camas becomes known as a destination location, both for locals and those that are passing through the area. Terri explains that after commuting to Portland for 20 years, she was looking for a way to get involved in a more local business adventure. 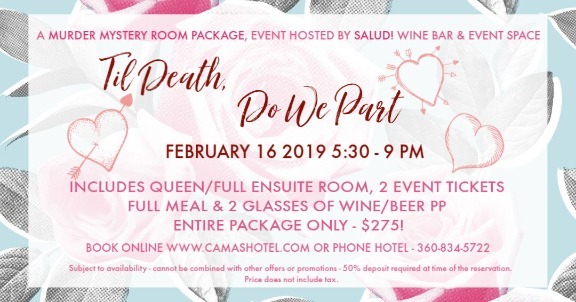 She said that the Camas Hotel grabbed her and her husband’s hearts right away. “We both completely fell in love with the beauty, the history and the charisma of the Camas Hotel,” she said. Terri goes on to explain that Camas has really started to grow and with that, so has the list of loyal hotel goers. 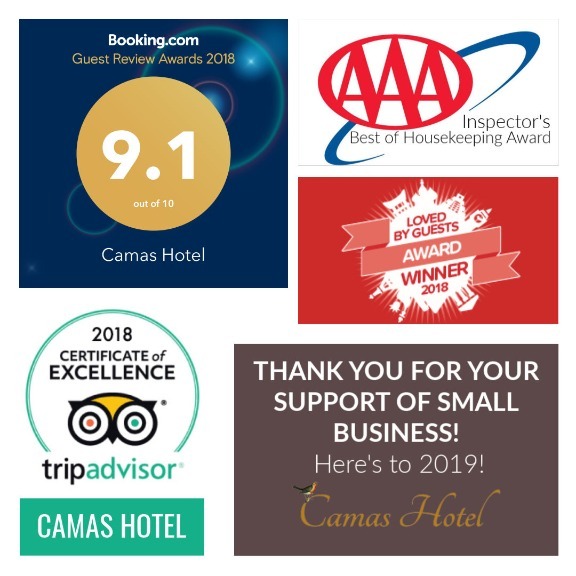 2018 was a great year here at The Camas Hotel! This year we were awarded several awards based off of reviews from both guests and companies! We want to share our awards and thank everyone who contributed to our successful year! Tripadvisor 2018 "Certificate of Excellence" Winner. 7th year in a row! We are so thankful to have been recognized this year and we're so excited for what 2019 is going to bring us! 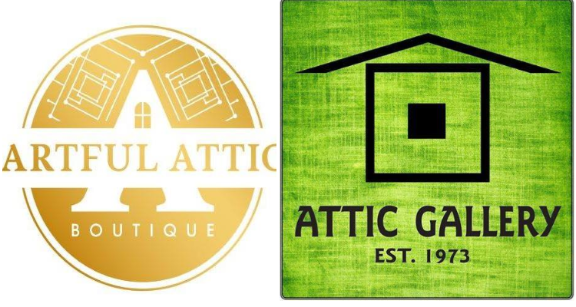 ​Did you know we have two Downtown Camas businesses with “Attic” in their names? Attic Gallery (421 NE Cedar) was started by Diana Faville in her home’s attic in 1973. The gallery flourished and later moved to Downtown Portland where Diana and her daughter, Maria worked for many years. They made the move across the river 3 years ago and have been bringing amazing local art to downtown ever since. The Artful Attic (217 NE 3rd) opened in Downtown Camas this October. Owners, Lori Lander and Tyson Morris started their business by creating recycled and upcycled pieces. Much of the material for their beautiful creations came from Lori’s late grandparent’s attic. As they cleaned out the house with Lori’s mom, they developed a love for repurposing items as they went. Their business name was originally Lupine, named after the flower, but Lori’s mom asked them to change it to The Artful Attic as a tribute to her grandparents. Stop by and check them both out – treasures of all sorts at both! Great gift ideas at both these locations!